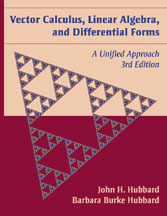 Eigenvectors and eigenvalues: Section 2.7 on eigenvectors, eigenvalues, and diagonalization bypasses the determinant; a few pages in Chapter 4 connect this discussion with determinants and the characteristic function. Integration and curvature: Section 5.4 discusses the Gauss map. Uniqueness of row echelon form The first and second editions left the proof of uniqueness in theorem 2.1.8 as an exercise. Now this important result is in the text. New exercises Including an exercise proving a version of Kantorovich's theorem with a weaker continuity condition on the derivatives; this has implications for the inverse and implicit function theorems. Programs posted on web No more laborious typing! The three programs used in the book are available for cut-and-paste at math programs.